In Summer 2017 Unit London presented the first major London exhibition by PichiAvo, the Spanish duo who have become one of the most talked about talents in the global urban art community. This exhibition followed a commission for New York’s iconic Houston Bowery Graffiti Wall, where they were the latest in a line of celebrated artists - from Keith Haring and Kenny Scharf to Shepard Fairey and RETNA - to paint the famous wall. 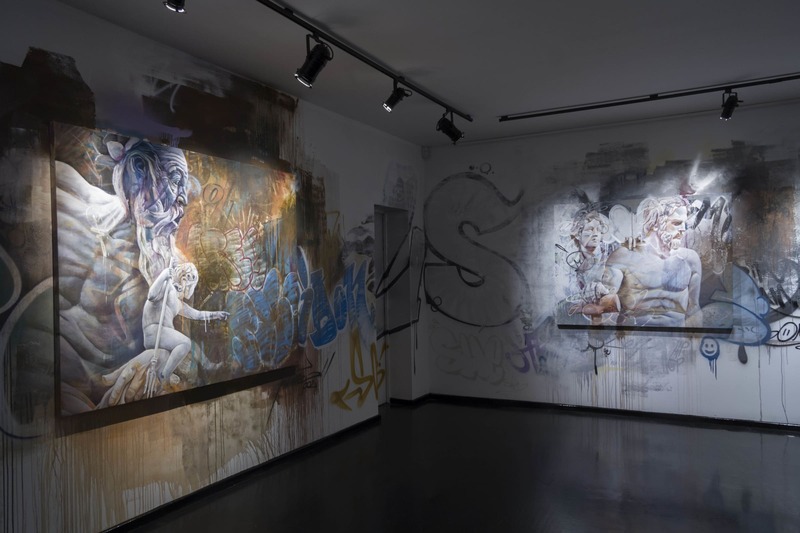 With In Gods We Trust they remix classical references with contemporary urban imagery, with each painting dedicated to one of the Greek Gods. Zeus, Hera, Poseidon, Ares, Hermes, Hephaestus, Aphrodite, Athena, Apollo and Artemis were the protagonists of this landmark exhibition which was intended by the artists to be a reflection on timeless values of courage, beauty, freedom and perfection. Offering Londoners a colour-saturated spectacle in the summer of 2017, In Gods We Trust saw PichiAvo create large-scale murals across Unit London’s Wardour Street facade and inside on the walls and pillars of the gallery’s basement space. The painted walls of the gallery provided a dramatic backdrop on which the new body of work sat- 15 canvases that appear as part of the larger mural. Those lucky enough to purchase one of their works got to take away a precious fragment of the artist’s larger work. Graffiti lovers got the opportunity to follow the creation of this street art spectacle in the flesh and via Instagram. Juan Antonio Sanchez and Alvaro Hernandez - better known as PichiAvo - were brought together by a shared love of visual art and an antipathy to the self-centredness of much graffiti art. Their resolutely open approach avoids the formulaic stencil and spray techniques of much street art and combines strokes and signatures with collage and the loose and expressive painting style more associated with fine art. Since 2007 they have worked as one, taking their effusive murals to walls around the world, including commissions in Norway, Greece, Portugal and the US where they recently created a mural for the Miami Dolphin’s new Hard Rock Stadium. In 2016 their mindblowing depiction of Zeus loomed majestically over a used car lot for Bristol’s Upfest and they were commissioned by the Manchester International Festival to create a giant mural for the city’s Northern Quarter.